Those of you who have followed my blog for a long time may remember my old Garden Railway. This was built at my childhood home before being dismantled a few years ago when Mum downsized and moved to South Wales. It was Eastern European based, and featured almost exclusively LGB models, often detailed and weathered. It was a lot of fun and I enjoyed working in a larger scale, and certainly the extra dimension of real materials, real life, wild life and day light! 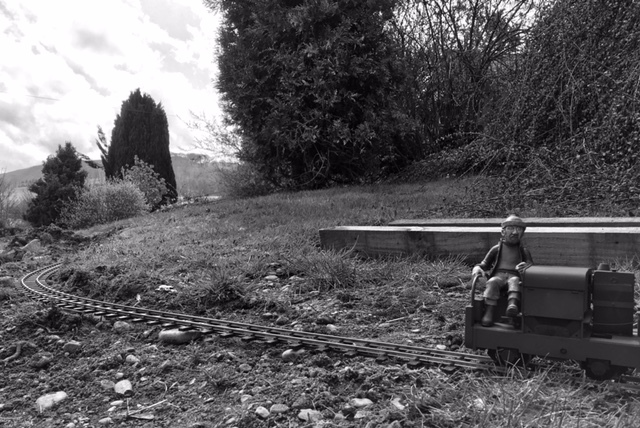 For a while I've been toying with the idea of a new garden railway at my home in North Wales. Perhaps using 32mm track this time... 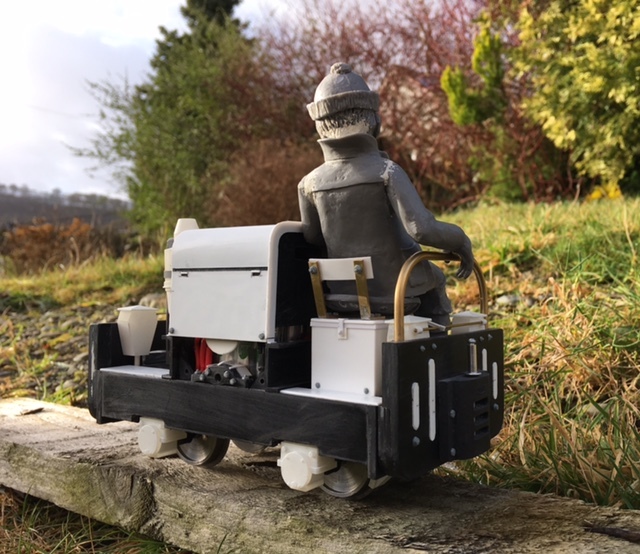 I've been selling unsused items around the home and raised enough cash to start this project in earnest - and as a result, have made a rather unusual decision to work in 7/8ths, and not just that, but work to build my own 18" gauge tramway (rather than 2ft!). I've got a few wagons (a Swift Sixteen flat, to build a Dalmunzie style open coach and several from Si at Model Earth, a flat, a barrel carrier and a van) and some parts and plans to build a Simplex - opting for a 1950s 40S model. The opportunity to work in such a large scale is exciting and a little daunting - but I'm looking forward to creating models with real presence, and as a diversion from my day to day model making. More soon I'm sure... and possibly a seperate blog... we'll see! So why not combine my skills and work with what I know. With that in mind I fired up Sketchup and starting drawing up some of the more complicated or repeated items that form the basic details for the 40S. Front to back left to right you have four sandboxes and lids, these are a more modern design then the 20/28 version, and the lids have a lip so they locate positively on the top of each sandbox and could be posed open, bent or slightly ajar. The next row are four axleboxes with bolt head detail. The leaf springing is slighly represented at the top and this also forms the surface I will use to glue these in position behind the plasticard side frames. In front of these are four brake shoes, slightly reduced in size from the prototype as I will be using 30mm diameter (rather than 34mm diameter) wheels. Front row, you have a filler cap, not sure what for but it's shown in different positions on the 40S photos I'm working from, sometimes in the lid of the hatch, sometimes protruding through the back under the controls. On the right is some sort of filter canister (in two parts) which is hollow and goes next to the radiator on the front. 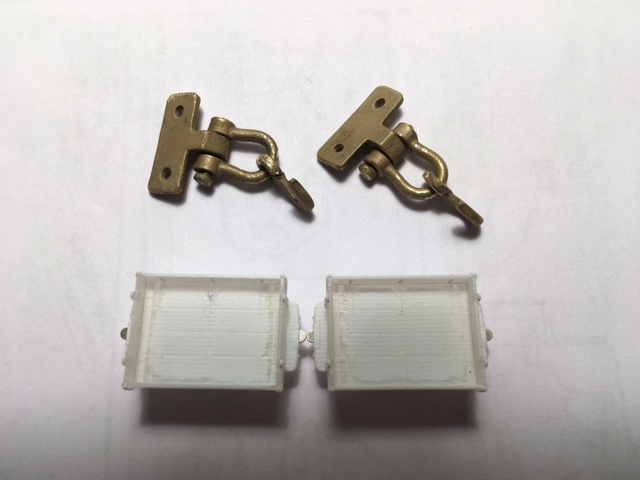 I have sourced a few parts from Si at Model Earth including coupling blocks, radiator and a seat - intended for a 20/28 these will need a little modification for the later model 40s but are beautifully crisp mouldings. I hope my details will due them justice. 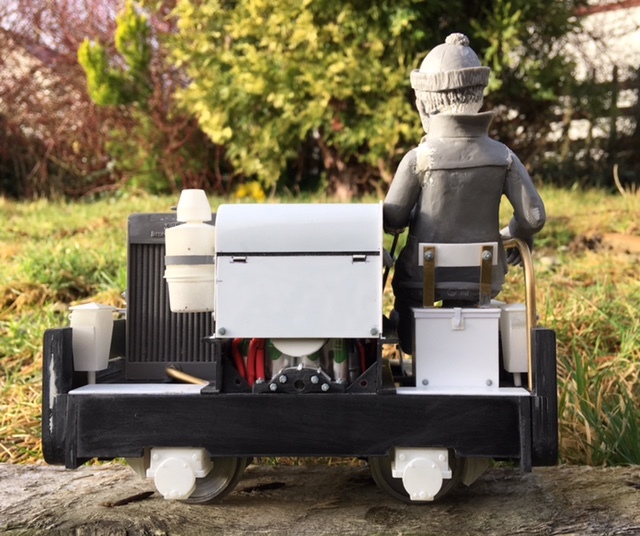 To power things I've commissioned Peter at PDF models to come up with a suitable drive unit that has chain drive to both axles from a centre motor, like the prototype, and that as much is visible as possible. Great stuff James, I look forward to seeing more in the future. The parts I designed have been delivered from Shapeways and look superb, I'm really happy with these, and the finish on them. They won't need much cleaning up to work really nicely. The axle box and brake shoes feature nuts and washers! I've incorporated features like this on prints in 4mm scale but they're tiny, these actually look like you could undo them! The sand box lids look good, but I mis-calculated the lip on the underside so they'll need cutting down to fit flush with the top of the sandbox. The air filter and fuel filler lid look great. I've mocked up the gauge and size of wheels on paper, and have been overlaying these on the end elevation - seen here with the 'winter driver' I sourced from Si at Model-earth. This gives a feel for the size of the scale, and I had to get a driver early on, so I could work from something. Finally here are the 'Simplex bits' from Si at Model-earth that were suitable for the later 40S I'm working with. The top of the radiator will need modifying but the rest of it is a lovely casting. I've also picked up some nuts and bolt heads from Cambrian models - unfortunately they were out of rivets else I'd have had a set of them as well. More soon, once the chassis arrives and I can begin to build the frames. The first pair I have tackled are probably the more 'complex' of the pair - not that this sort of modelling is particularly difficult - just large! On the left we have the Welsh flat 'slab' carrier, and on the right the Budget range small van. Before I show more of the former, it's worth reflecting the similarity between the van and that drawn in Brian Clarke's book 'Slate Railway to Churchwater', describing a ramshackle charming 15" narrow gauge tramways in the Welsh borders north of Hereford. Although a work of fiction, Brian illustrated it beautifully and it's this charm that actually was one of the inspirations behind the 7/8ths project. 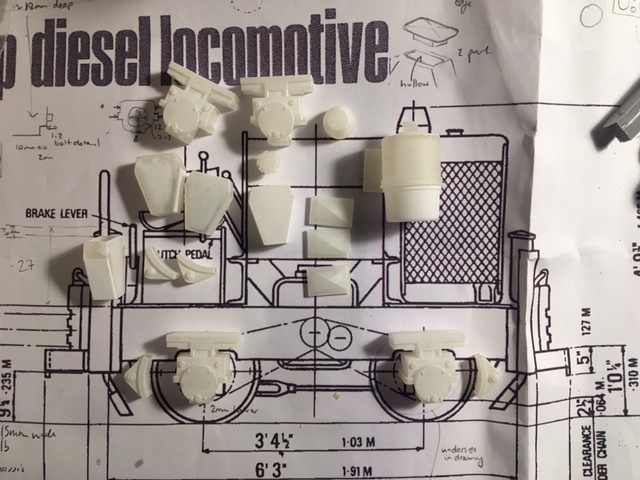 I obviously don't have space for my own small tramway, although I did toy as I've said before, with the idea of a 7/1/14" gauge line, so this project using 32mm track to represent 18" gauge in 1/13.7 (or 7/8ths of an inch to the foot) scale is about as large as I can reasonably go... In Brian's book the forestry commission build a few spurs during the interwar period for plantation establishment - and the van belongs to them - I intend to model mine in a scruffy condition, and may well letter it for 'Forest Spur Use Only' in a nod to my inspiration. This was quite easy to assembly - a simple one piece chassis, and four interlocking walls with a single piece roof. The roof is only balanced, the chassis and body just a tight push fit, and the axle boxes only glued on one side! The flash cleaned up pretty easily with a knife, razor saw, files and some sand paper. I glued the walls with thick superglue. The Welsh chassis with slab carrier parts looks great - I wanted one of these before Si stops making them - I've built mine the opposite way up to his instructions because I was looking at the drawings in 'Slate Quarry Album' and noted the couplings seem to be mounted to the underside of the chassis, rather than the top - so we'll see if that works! This took a little more cleaning up, with more pouring sprue on the main chassis casting and the axle boxes too - but it went together easily. The plastic parts supplied cut to length fit perfectly - it's a joy to work in such a large scale, especially with such well designed kits. I've cleaned up all four of the wagons, I need to make decisions on couplers and furthe detailing before I go too much further, however, it's been excellent to make a start and begin to get a feel for the size of these models. First up the brass Talisman couplings that came with the Welsh slab wagon have been cleaned up and blackend - they look great. I think the height works well here, as I said, I deliberately mounted them low on the Welsh wagon to match the photos I had, I wondered if they'd work on the budget range - and they might, but would probably need the centre 'pillow' blocks removing, because whilst they do 'just' clear the rail head when hanging loose, I've a feeling they look just too low mounted underneath the blocks. Here you can see I've finished the prep work on the barrel load, these are lovely mouldings, and will look great painted and weathered - my intention is red with the centre band yellow - having researched barrels a little a few weeks ago! In terms of painting I'm not sure what I'll be doing really... I think the frames will be distressed grey paintwork, and decks will be exposed weather beaten wood. The van may be grey too as a result, we'll see... I might just go for a creosoted look to the barrel load frame? 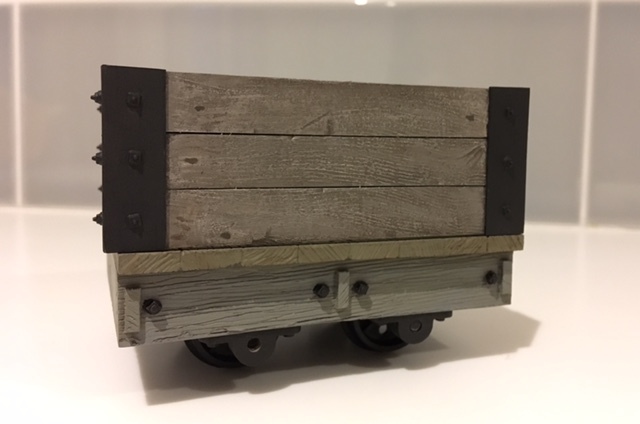 Last shot - the final flat wagon is finished - this is likely to receive some sort of A frame in the middle - like the Corris wagons - although I'm a little worried about stability, so this may receive some smaller 24mm disc wheels. It's got a rather silly 009 load on it - the original prototype Bagnall side tank we released through Narrow Planet at ExpoNG. I've still got around to finishing the build and taking proper photos - another thing for the list in December. The basic operations were very straight forward. I cut 80thou plastic styrene sheet with a Stanley knife to 12mm wide. I used a flat chisel bladed craft knife to smooth the edges and remove the burrs formed from cutting with the Stanley knife, and to add a few nicks to the plank edges. I then used a razor saw dragged along the surface to generate a sort of wood grain effect. 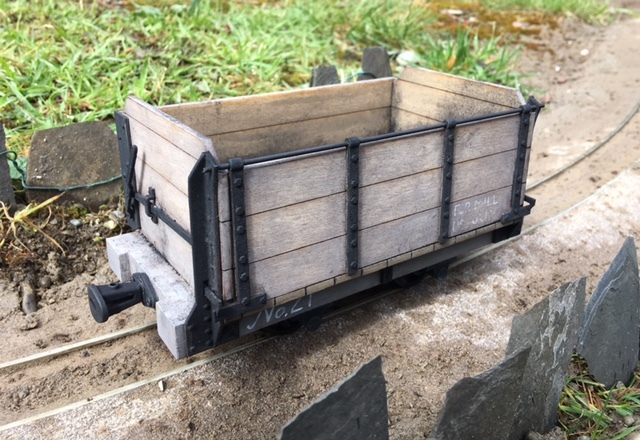 Looks good James, I'm intending to do something similar to turn some of my Swiftsixteen flats into Glyn Valley style mineral wagons. I ought to get some of Si's budget wagons for variety. So how did I get the finish shown here? For the wood, I wanted to achieve a sun bleached unpainted look. I started with Humbrol Matt 72 as a base, then dry brushed with a light grey mixed from white (34) and Humbrol Matt 64. Once dry I used Humbrol 64 to add more texture and details, curving to match the grain. Then I used 98 to pick out knots, and add some patterns to the wood. When all of that was dry I used a wash of Matt 98 and Matt 173. For the metal I mixed Humbrol 27004, 98 and 173, and painted this on neat to the corner metalwork and touched the bolt heads on the inside as well. I'm wondering if it needs another wash on the planking, and I intend to dry brush with a touch of gunmetal on the metalwork, and give it a light polish before sealing with lacquer. Whilst I had the paint out I've made a start on the chassis, this has the deck painted with Humbrol 72, and a wash of 72 on the chassis sides over the grey primer. I plan for this to appear like a wooden deck and an old grey painted chassis. The metal work has been painted in the same fashion. It's been an interesting journey building up these colours and layers, studying photos and experimenting with techniques I'm not so familiar with using in my usual 009 modelling. The planking looks good to me, I suppose it depends how old you want it to look but that looks spot on for a wagon a couple of years old. The main side frames and ends were cut first from 80thou styrene sheet, and then glued together around the custom chassis designed and made for me by Peter at PDF models. The axle boxes glue inside this and look excellent. The next stage was 60 thou sheets at each end to rest on the top of the PDF models chassis, and provide something for the chassis to be screwed/bolted into at a later date. The U beams are 60 thou styrene cut out, the tops need some 40 thou adding along the inside edge, but I need to fit the batteries first to make sure there is space - and then I'll mock up the ends of the engine/fuel tank/gearbox for each end to hide the drive. The small 45 degree fillets are 60 thou - and have a hole formed in them. The radiator has been modified from the Model-earth casting. This has had the top cut off, as the 40S had a later, plainer looking radiator top, on top of the old block from what I can see in pictures. 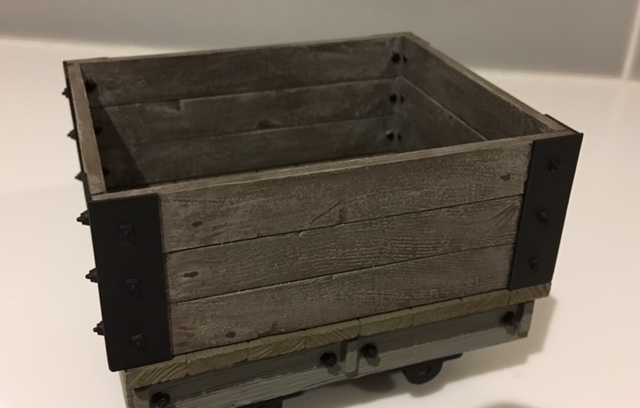 I've made a start on painting some of the other items of rolling stock - here the barrel carrier and small van have been primed and the first coats of paint added. The Simplex is looking nicely proportioned - I need to source the radio control system and batteries next. This is where things stood yesterday, I'd fabricated the two buffer beams and had posed the driver in position (without head) to check on appearance and properties. It all seemed good - and it's mock ups like these during the construction process that give me heart and renewed enthusiasm to continue. So today I had decided to push on with the driver position. This meant building the drivers seat, fitting the floor, sandboxes, handrail and clutch pedal. The handrail is 3mm diameter brass rod, quite hard to bend so it took some time to get the correct profile, it's beefy looking but matches the drawings and photos I have of the prototypes with these fitted. The sand boxes fitted to the end of the cast weight, with bolt heads from Cambrian to give the impression of actually being bolted rather than superglued in position. The sanding actuator rod is 0.9mm rod, in plasticard brackets. The chassis was filled in with 30 thou styrene, the centre piece scribed to represent some chequer plating. The seat box was made from 40 thou styrene. The details are Cambrian rivets, and microstrip and micro-rod for hinges and the top strengthening section. The seat is from Model-earth, and is a touch oversize, but so much better than I could have achieved - it's a lovely casting. The back was made from brass section and plasticard with Cambrian rivets and bolt heads. The clutch pedal is 40 thou styrene, micro-rod and some Cambrian bolt heads again - and is mounted in a low position - so partially engaged I'd imagine, but this is to suit the drivers foot position! The seat box looks good in position, but is mounted in such a way that it can be pulled off - as I'm not sure whether the charging socket may be located underneath. I have sourced a Radio Control system from Peter Spoerer, including AAA battery packs which will be mounted within the bonnet. The final shot shows the driver in position, I have fixed one arm and hand in position, resting on the handrail, and his head is turning slightly over the bonnet. I cannot add the second arm until the bonnet and levers are in position. His foot presses on the clutch, and he sits nicely in the seat, although his back doesn't touch the back rest so he's obviously got great stomach muscles! The chassis is a PDF models custom unit, which I've described before - centrally mounted motor and gear box driving both axles through delrin drive chains, like the prototype so to speak. Peter did an excellent job to match my brief, which involved cutting out as much of the side frames as possible to allow lots of day light to show through when viewed from a low angle. The radio control system was sourced from Peter Spoerer and included a transmitter, receiver, battery pack, wiring loom and charger. I have fitted the charging socket and on/off switch on the underside of the model, tucked to one side, so as to allow the chassis to be dropped out if it is needed in the future. To ensure it's held tightly together I have used some electricians tape, time will tell if this is a sensible move, but it does mean the wiring is protected somewhat from damage, and holds everything together firmly ensuring there is clearance from the bonnet which I've begun to fabricate. I chose the 40S because it was short and stubby, and had the bonnet curves in the later orientation - a feature I quite liked, so I'm pleased with how my attempt at replicating this has come out. First though I'll mention the driver, he is a Model-earth 'winter driver' figure, and I've now fitted his second arm and hand, which is grasping the drive handle. This is 0.9mm brass with a blob of blu-tac superglued to the end, and coated in more superglue. The same for the shorter reverser handle. Not 100% accurate in location but with the driver fitted they look fine to my untrained eye, and match the character of the prototypes I've studied. The bonnet is actually made of a core and overlays. The core is 80 and 60 thou black styrene chosen for strength as this part is removable. The front and back of the bonnet were cut first in the thinner material, and had cut outs made for the various controls, fillers etc - although not all of them are there, as I wanted some strength in the bonnet front so behind the radiator it's solid when it should be open. The sides and top were next, the sides in 80 thou with strengthening fillets in the corners, and the top was 60 thou. The curved sections were formed initially with more black styrene in 60 thou 3mm wide strips, all assembled with Humbrol polystyrene cement. Once this had dried, it was smoothed over with sand paper to get a smooth curve to the edge, and the overlaps all level. Then the thin (20 thou) white styrene overlays could be added. The lower sides and bonnet front were done first, and have small cut outs for hinges (in styrene rod) with securing nuts (from Cambrian) attached. These were attached using the liquid polystyrene cement, as they are flat pieces, where an extended drying time isn't a concern. Once these were firmly attached I began work on the bonnet top, using the same 20 thou styrene but this time using Superglue gel. Applying the gel to the bonnet and spreading it out, you have a little longer to work then with the superglue in liquid form, so the bonnet can be held in position as it dries to form neatly around the curve. I tried both ways, once all in one go, and the second the vertical bit first, before forming around the curve - both had positives and both had negatives and you can't tell the difference in the finished result. You need to firmly press this into place over a ten to twenty second period to ensure it stays stuck - once dry I used fine wet an dry paper to clean up and round the edges, and the hinge along the top was added in round styrene rod. I added 1.5mm L section styrene to the frames, which holds this bonnet in place, and will mean it's removable. In this last shot you can see that the sandboxes are now in place at the non driving end, although I've yet to add the nuts to the buffer beams. This involved spraying the fan I'd made in grey primer (as it was white) and then supergluing the fan housing to the casting from Model Earth. I then used Cambrian bolts and rivets to finish this off and glued it in place. I'll fabricate a bottom feed pipe later. On the buffer beam at this end I also added Cambrian bolt heads where the sandboxes are fitted. So here the three items are actually coupled together, and if I had any track to run it on would actually give a train! Shock horror! The Simplex is pretty much there now - definitely the home straight so my thoughts have turned to the next project - the Motor Rail coach built for Dalmunzie. I'm pondering on some passengers first, so that the bench seats can be constructed to the right height... again I quite like the figures Si offers, so it may be that some follow in 2018 after Christmas. In these photos the van really does look very bright - it's been painted in 'leather' which I was hoping could be toned down somewhat to look like faded brown paint. That might be between Christmas and New Year when I visit my Mum again... anyway, festive best wishes, I'm not sure how much modelling will take place in the coming days with family commitments. Thank you for reading the blog and my modelling topics on various forums over the year - and the engagement, questions, encouragement online and in person at shows and exhibitions. Best wishes to you all, and I hope Father Christmas brings you all some exciting projects for the new year! Here you can see the Simplex, posed on a potential section of my planned garden railway, with a number of wagons from Model-earth kits/castings. 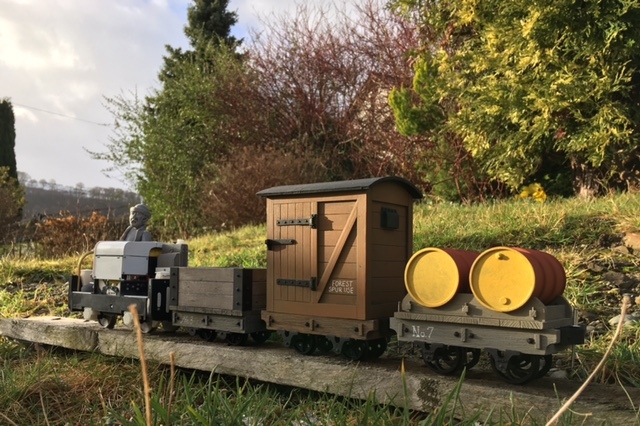 The open wagon and van are nearing completion now, the barrel wagon a touch more work in painting and then weathering to bring it to life. The barrels are red with yellow ends, like the Shell ones of the 1950s. So here she is, there are probably lots of missing details, and others I've included that are wrong - but I'm more of an artist than an engineer, and it looks right to my eyes. Since you've last seen it I've added low relief engine and gearbox details to disguise the batteries, fitted the air filter canister, fabricated a hand brake (which I've had to imagine has been somewhat modified as the long lever wouldn't fit past the drivers boots and still allow him to be removed easily, and the sand box lever actuator cable (which is prototypically bent!) behind the radiator. A small control panel will be made for the small slot in the engine cover, but this will be after painting, and the tool box I am planning will also be added later. Here the drive side you can see the low relief gearbox and drive housing does a reasonable job of disguising the battery - as well as the bent sand box actuator rod. The handbrake isn't quite visible, unfortunately as I'm quite pleased with the impression of the ratchet mechanism. From the back, the other side also has some low relief parts and the wires for the switch and charging socket won't look too out of place once painted. Nicely done and a prototype rarely modelled. I built one in 7mm, about 15 years ago and I don't think I've seen a 40S model since. Excellent choice of reference material too! Lifting a pristine finish of a model to the work worn lustre of a real locomotive is something I aspire to with all my models but this scratchbuilt Simplex has posed a few new challenges. Working in such a large scale is new to me but I fell back on my time learnt technique of studying prototypes, before using oil paints to wash in oil and grease build up, dry brush burnished metal and powders to represent spilt sand. The latter from my recently rediscovered collection of Mig weathering powders. I don't think it's finished yet - so I've not sealed it, but it is a good start. One big decision is whether to add a number to it, I'd pondered about a stencilled affair on the front of the bonnet, rather than the sides. It also needs a tool box of some description on the foot plate. I don't have a firm plan on what I hope to achieve, which may end up causing me a problem, but at the moment the idea is a relatively short single track line, using small internal combustion engines, where I aim for a high level of realism and scenic finish with hand made real stone buildings, slate slab fencing, real ballasting etc. The first section starts at the back door and is a gentle S-curve to minimise the gradient to the current summit, from where the line will stop, or head out across the main lawn - which will require some further negotiation! The track bed is dug out and I laid some track to get the Simplex and a few wagons out for testing in the spring sunshine. Lots of promise already, I'm very excited about having something to tinker with over the summer. I need to add a good firm stone base before I lay the track, and come up with some way of pinning the track without deep foundations as the ground here is strewn with rocks and very difficult to dig up! Lovely James, would the odd brick sunk in the ground be enough of an anchor? You will still get some movement with ground heave but they should stop the flextrack from moving too much. The other option is to custom bend the rails into track panels and effectively make custom set track and just do the same as you did with the G scale. The Motor Rail estate coach really needed some passengers and there isn't a great deal of choice for semi realistic figures in this scale. Luckily there are Model Earth figures to choose from though, and although their heads are perhaps a little larger than I'd like (I much prefer the diesel driver) with the coach roof on it's less noticeable. These two are from the Penryhn Payday set, and I've glued them together to sit with their arms resting on the arm rests. I had to modify their bottoms to sit nicely on the bench seats, but with the gaps and this work then blended in with filler, once painted this won't be noticeable. Next up on the coach is fitting brake gear under the chassis, and these parts are due from Shapeways this week. I also picked up one of the new 'skip chassis' from Model Earth. This is a bargain if you ask me, and does require a little modelling too, drilling holes and fitting the axle boxes with tiny bolts. I've fitted it with a Model Earth 'Welsh Flat' deck I had lying around which is a perfect fit. I'm planning on adding a brake wheel upstand and brakes to one axle as well. Also on the flat are some new bits and pieces, all bar the chain from Model Earth, which will need painting and finishing. 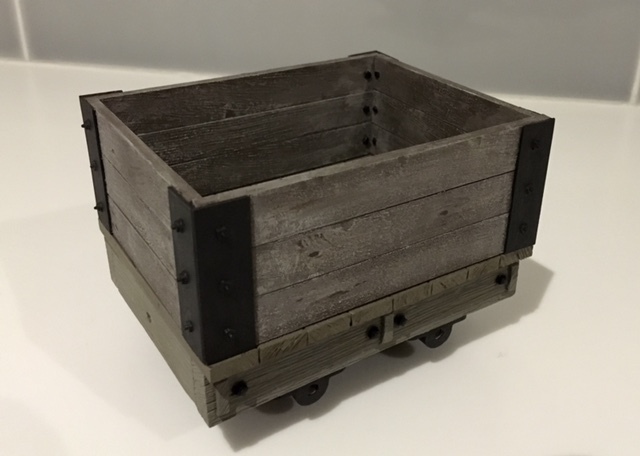 I've spent a fair amount of time trying to make plastic and resin look like wood, so I thought I should try out one of the Bole Laser Craft kits to see if i could make wood look like wood! These multi media kits are very clever, if a little expensive. The chassis is MDF, I have filled and primed this to look like one piece, but there is a little more to do in places. The body is plywood with sintered Nylon 3D printed metalwork, pre-died in black. It goes together very nicely and I'm looking forward to painting and weathering it. The question I need to decide on, is will this be the first of a few, to form a 'Trefor' set, or do I letter it up for 'Coal' to use on the Dyfrdwy tramway? 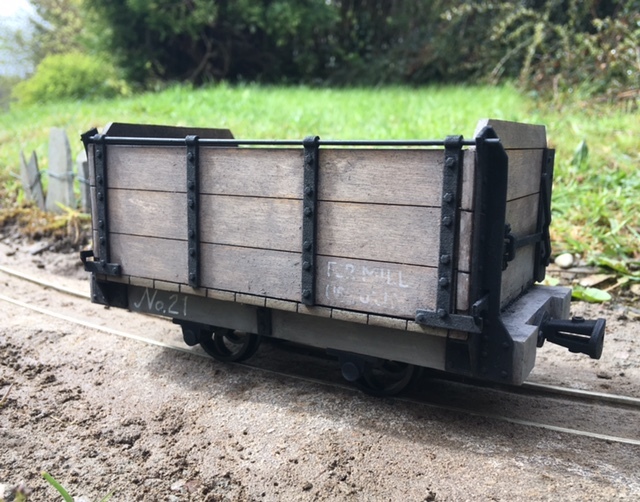 Finally, I've been building another flat wagon into a Churchwater style slate wagon using 80 thou styrene planks, 30 thou for the steel corners and then Cambrian 16mm rivet heads. This still needs quite a bit of work and is a little out of square so I need to see if I can correct this or if it needs stripping down and starting again. I plan to fit a brake to one of these as well, this one is rolling on an unmodified Model Earth budget flat chassis, but fitted with 24mm diameter Binnie disc wheels to drop the ride height a touch. More soon I'm sure... and news on some more commissions as well! So after I'd dug out a little trench I filled it with a mix of gravel sand and cement, tamped down hard but left dry. I tried to make sure this was level, or at least a consistent gradient. I then placed the track back down and 'pinned' it in place with U shape pins sold for pinning down weed control matting. I then troweled on 'Rowlands Mix', about equal parts cement, sand and peat. This was made quite wet, and then applied liberally to the track, smoothed in with a trowel and finger. As it dried I dug away at the flanges with a blade, to give clearance for wheels, and left it to set. The first photo is taken at the end of the line, the second at the summit, where there is an awkward change of camber, don't ask how, I thought it was all level. Nothing seems to have a problem with it, but you do notice, especially when the van goes over it! 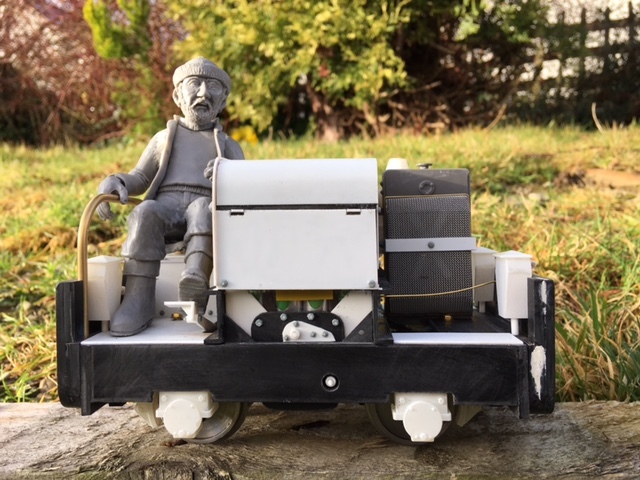 Rather than a specific wagon update here are a few photos of what I've been up to... first up the title image is a new 'lift off' body slate wagon I've built on a Model Earth 'budget flat'. This is 3mm thick styrene scribed and gouged for the wooden body with 30 thou styrene for the metal work. Since the photo was taken it has gained rivets and bolt heads, and I'm waiting on a set of 4 lift rings to finish it off before painting. 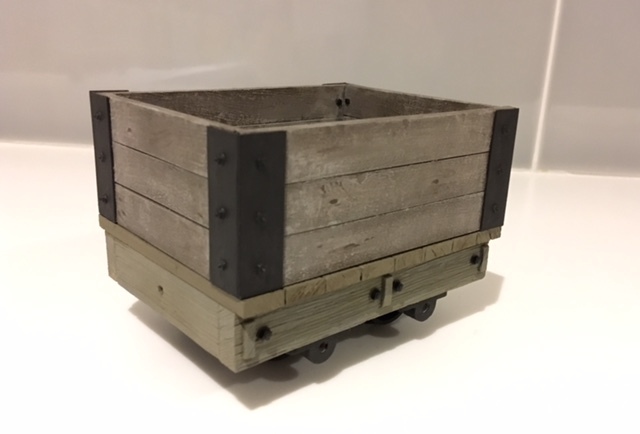 The Model Earth skip wagon chassis has been finished with a brake added, and a selection of items to sit on the flat as well. The top is from the Model Earth 'Welsh flat' and fits perfectly. These will be painted shortly... also pictured is my 006.5 version of the same wagon. Finally a photo of the slab wagon with a real slab of slate from the tips at the old slab mill at Nant-y-Pandy near Glyndyfrdwy. I've also been playing with slate fencing, this trial section was done quite quickly and I need to work on a neater way to do the wire, but it shows promise. Last seen here in bare wood I was a little apprehensive about painting it because I didn't want it to look out of place with my other stock that is resin and plastic painted to look like weathered wood. To this end I took two approaches. The chassis has been primed, sealed, smoothed and then painted to look fairly recently painted with a few rough edges. This was done with Humbrol 64. The inside of the body was washed with Humbrol 72, and the outside 64. This was put on in thin washes to build up the effect of old flaky paint. Once dry I weathered both inside and out with a dirty brown wash wiped off whilst still wet. The metalwork was painted with a mix of Humbrol 33 and 27004. I then added a real coal weathering to the interior, shaking around some coal dust, and then sealing it with dullcote.